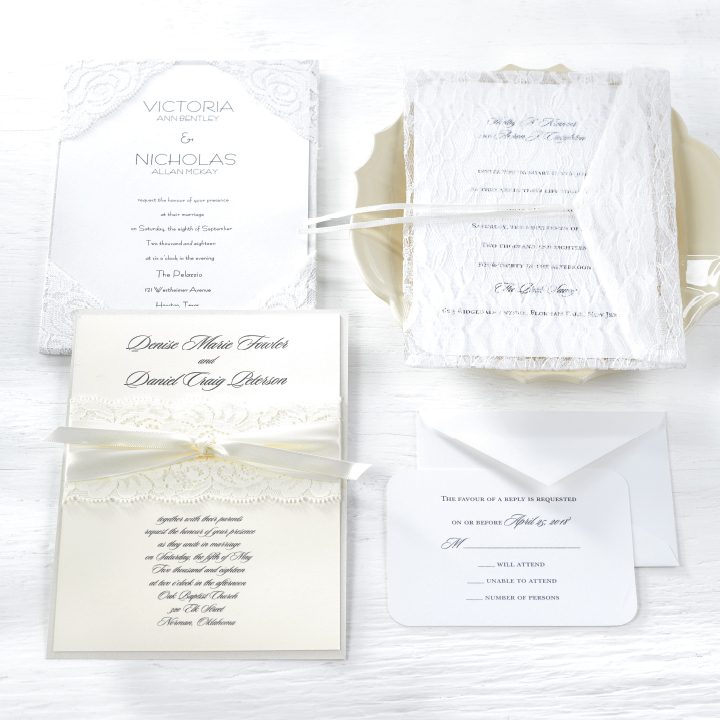 For many brides, they consider the invitation selection to be a very crucial part of tying the entire look, feel and formality into the wedding. 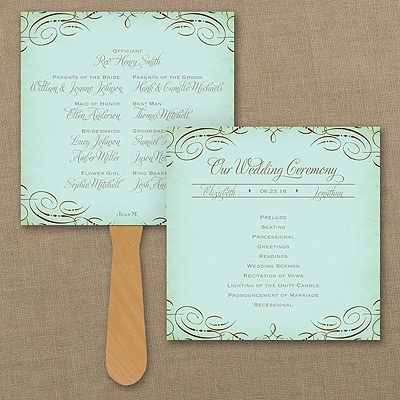 The more formal the event, the more formal your invitation should be. 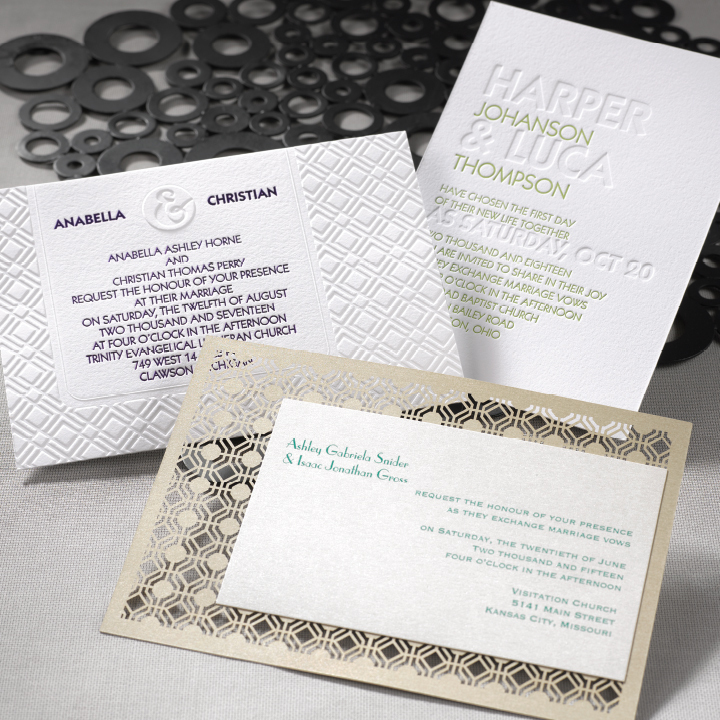 This encompasses the type of paper, the way it is printed (thermography, foil, letterpress, engraving, etc. 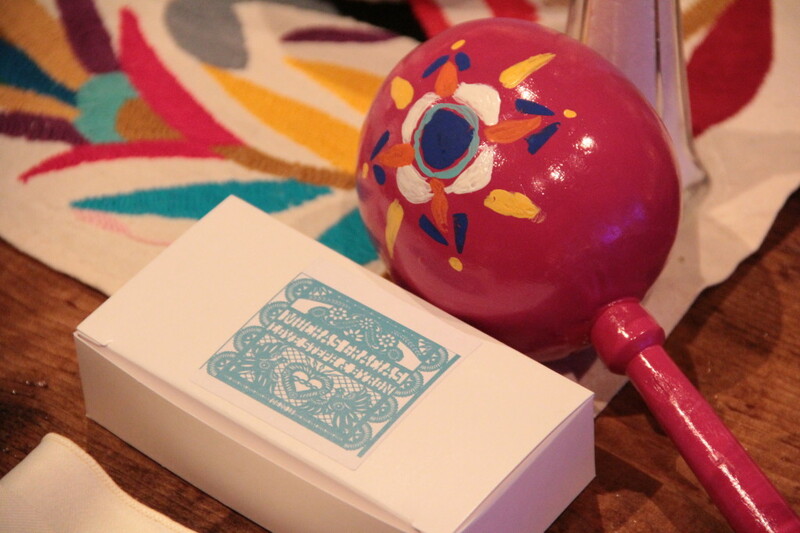 ), the size of it, the included items (pocket envelope, ribbon, brooch, enclosure cards, etc.) and the way it is worded (spelling of honour, favour, spelling out dates, etc.). 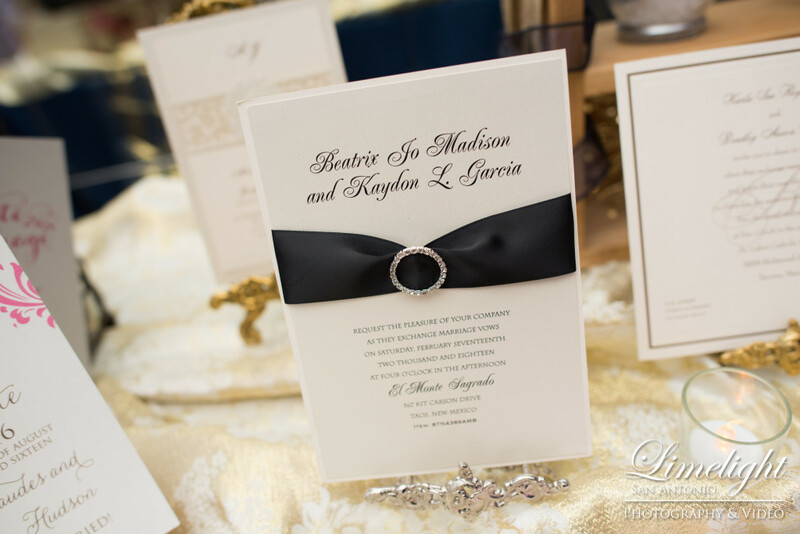 Invitations are works of art and are a memento of the special occasion that sometimes are framed and kept forever as a remembrance of the day. A lot of time should be spent deciding on the perfect one for you! 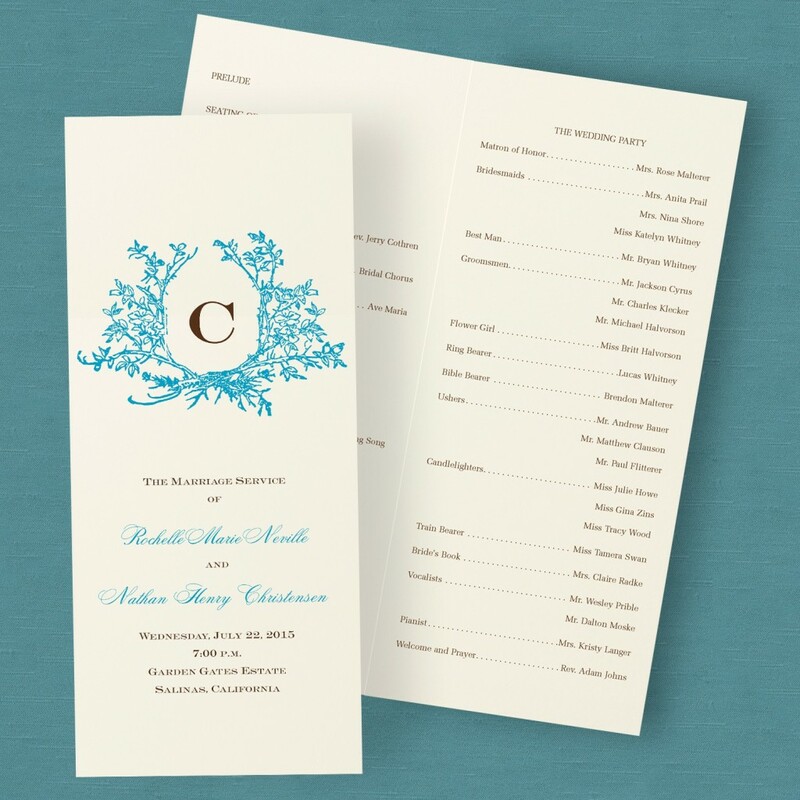 So, how much should you spend on your invitations? With most, if not all of them, the price depends on how many you purchase. The more you purchase, the less you will spend per invitation. What I mentioned above is also determining factors on the price. 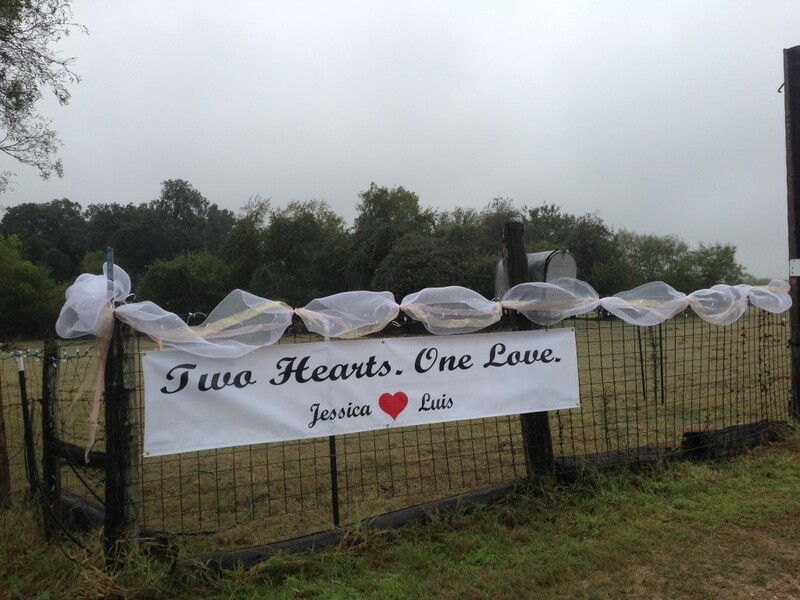 Option 1: Let’s go with a wedding of 200 guests and an average budget of $25,000-$30,000. 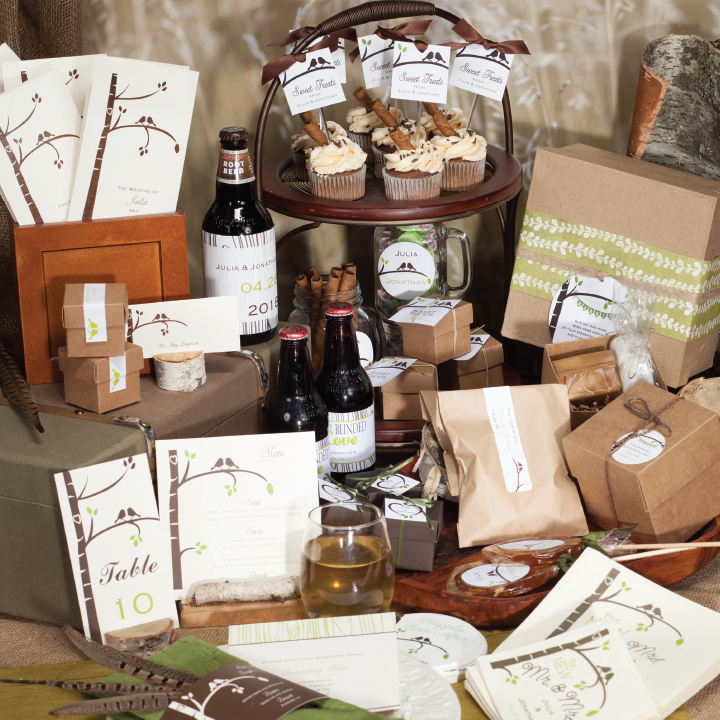 I have found that the bride has a smaller budget for invitations and wants to normally stay within a $400 budget. 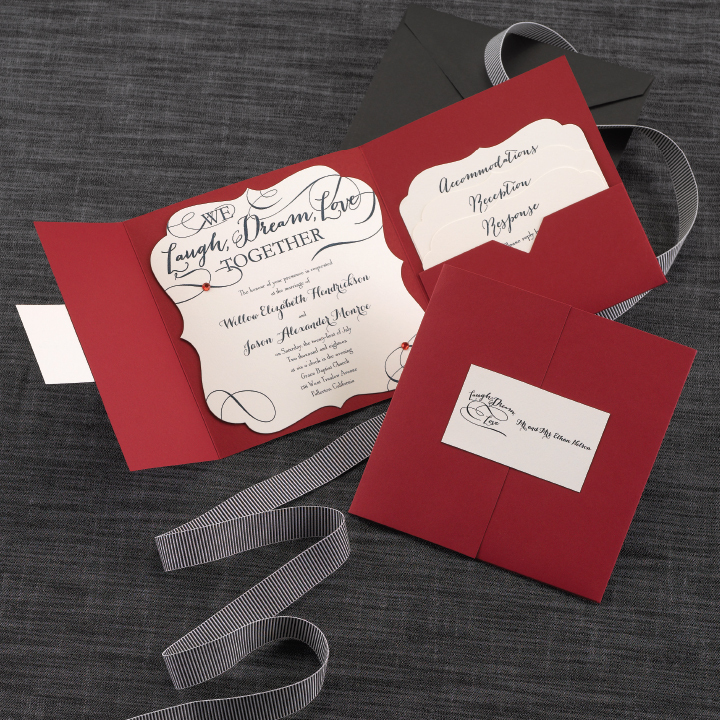 This includes everything: the invitation, RSVP card with return addresses on envelopes and shipping/tax. 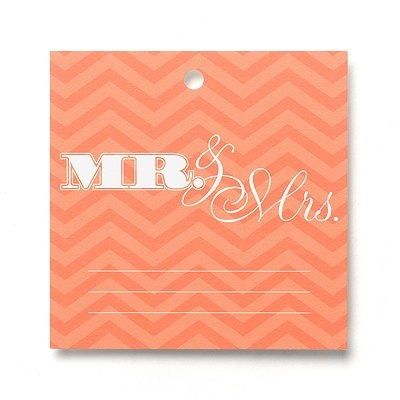 This bride usually will not have a separate reception card but rather include it on the invitation to save money. She might make it a little more formal by the type of wording she uses on it (a free option). 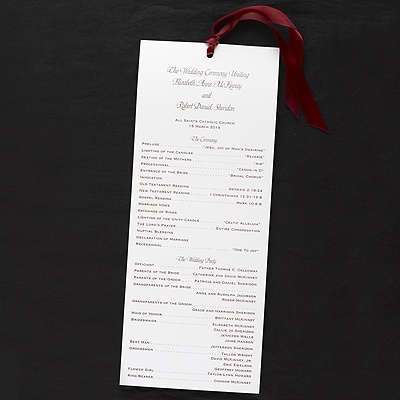 Option 2: For the more extravagant wedding with a budget over $40,000 for 200 guests, the bride is wanting to spend a little more for her invitations. I have seen some spend over $2,500. 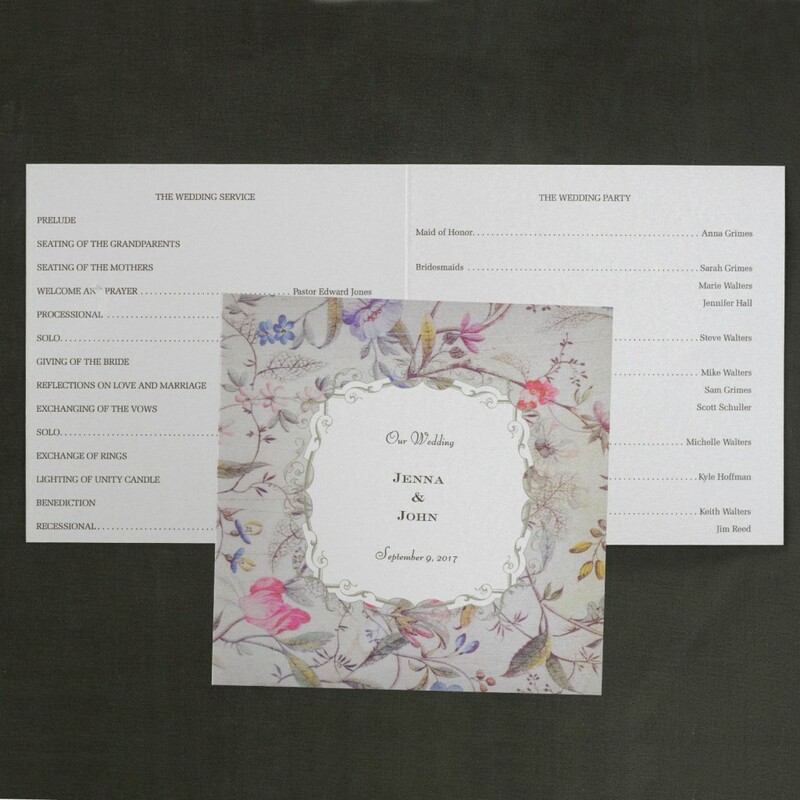 The invitations are very important to this bride and everything from the type of paper and printing process is looked at very carefully. An average amount for invitations would be closer to $800-$1000. 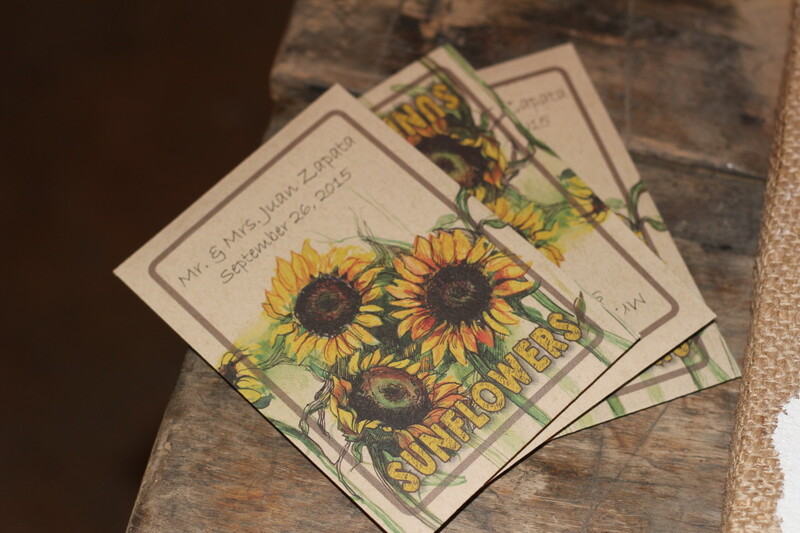 She might order the pocket and additional inserts such as the reception and accommodations cards. 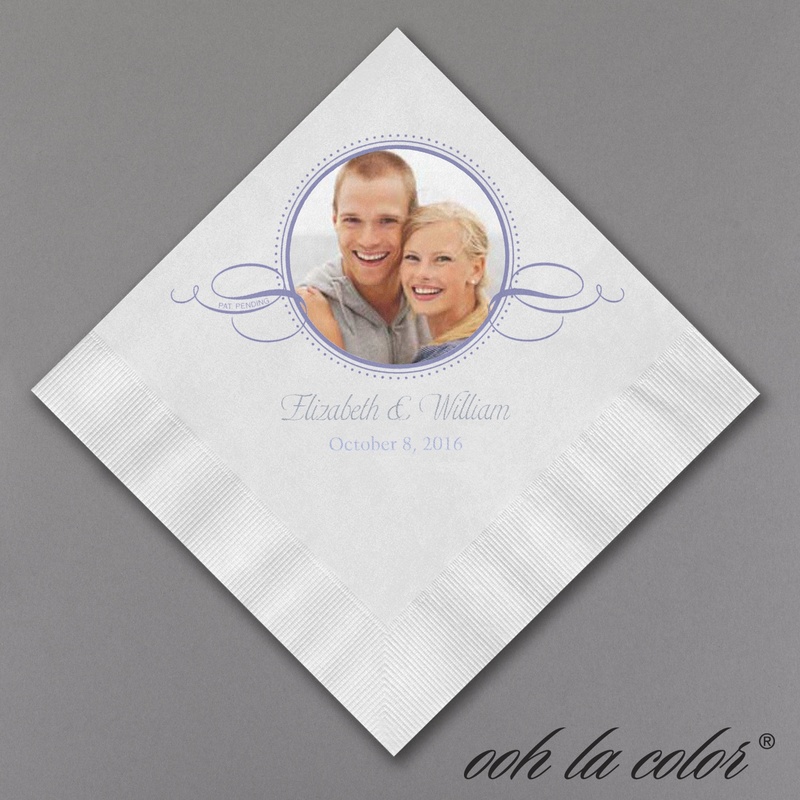 Napkins, banners, tags, stickers, labels, ribbon, etc. 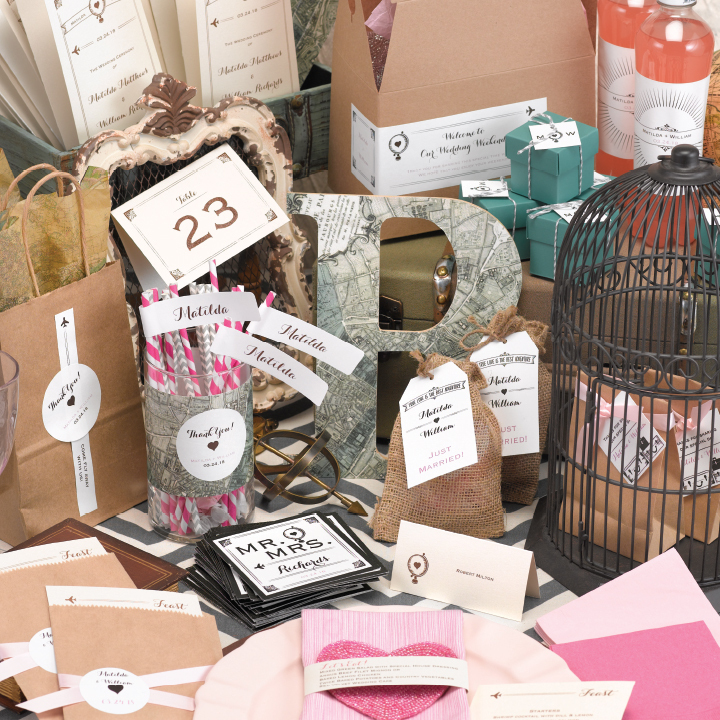 In the 2015 Wedding Report, the average amount that couples spent on these other items ranged from $83-$119. However, it didn’t list for how many guests. 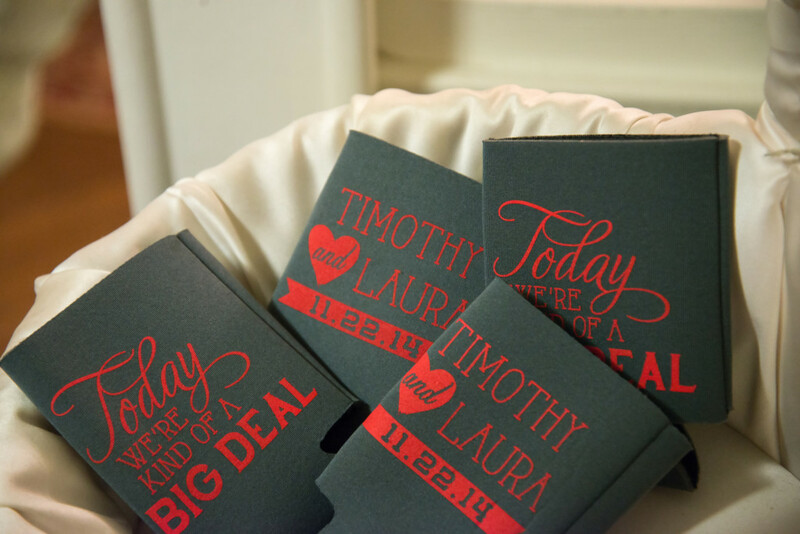 From my own experience with ordering these type of items for my brides, I would say that cost is a little higher in the San Antonio market. Programs, for example, start around $180 for 200. I’m sure you’re asking yourself, “Are all these other printed items necessary?” It really is based on your preference. 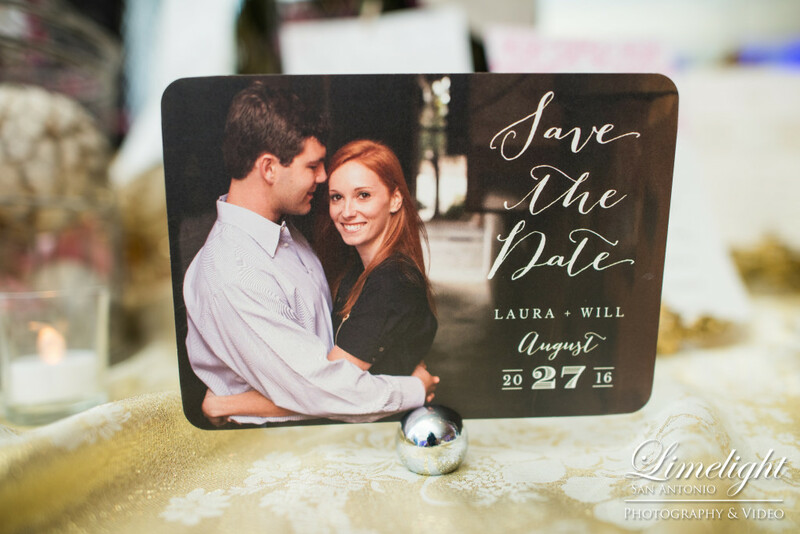 Save the dates have become very popular recently and almost all brides are doing them. 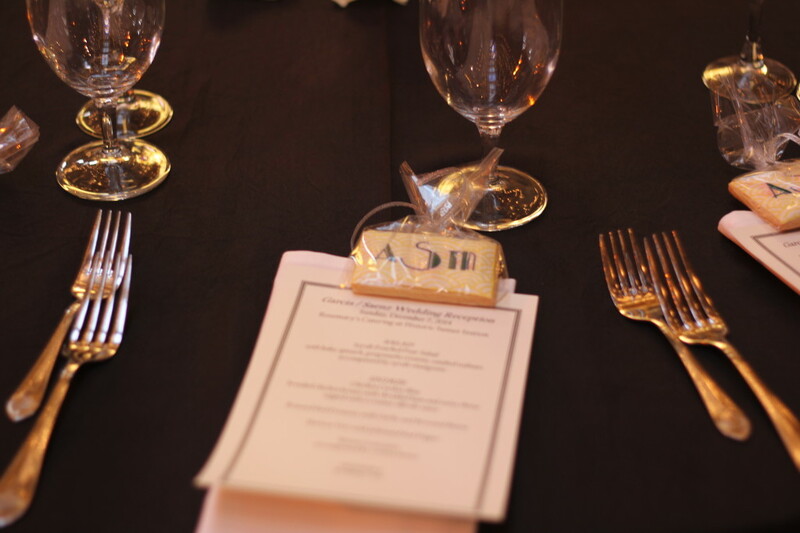 They want to ensure their guests know way in advance of their special day so they can plan accordingly. 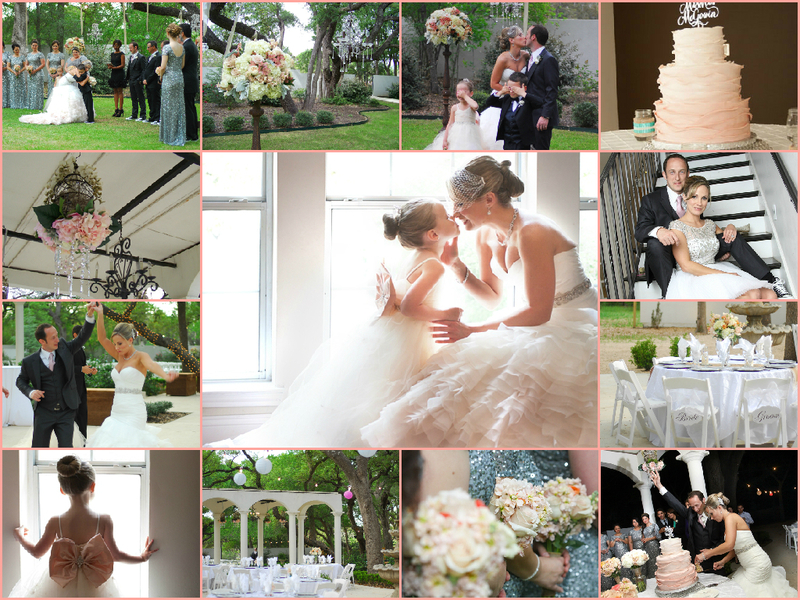 Programs are about 50% – half of the brides I have helped have used them. 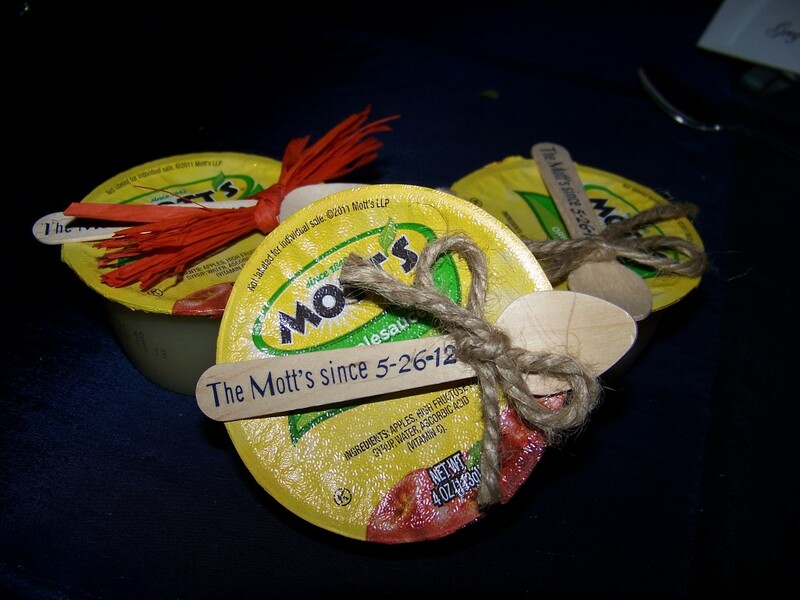 I see either menu cards, place cards or other personalized favors at almost every wedding. 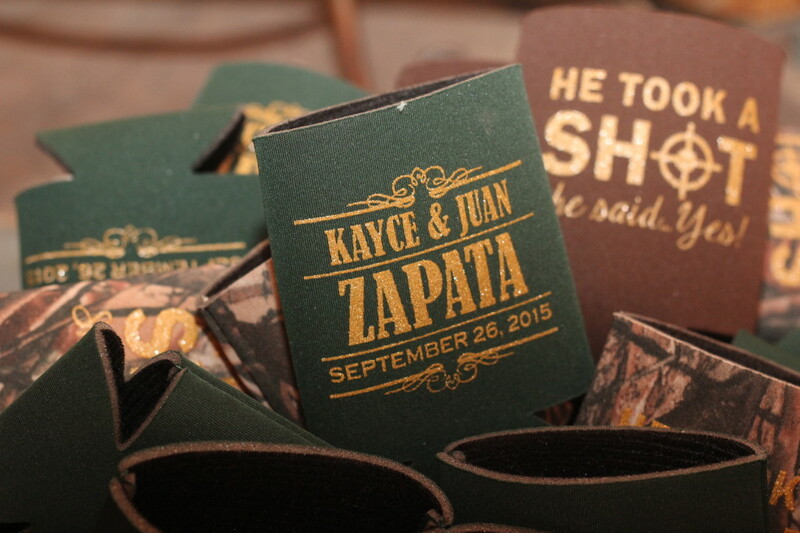 Personalized napkins and koozies are very popular as well. 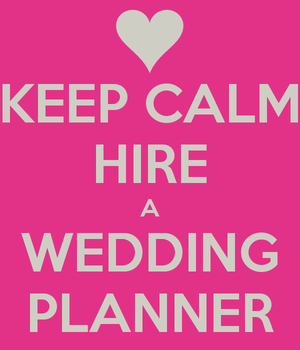 As a wedding consultant, I have worked with all types of brides when it comes to planning their wedding. At that initial consultation, I really get a sense of what they are like by how organized they seem to be, how much they have already planned before even meeting with me, how many Pinterest photos they have on their phone to show me, and how much they talk while I listen. The #1 reason why they have contacted me and considered hiring a wedding consultant is TO BE STRESS-FREE ON THEIR WEDDING DAY! They are the ones that get it and I LOVE IT! 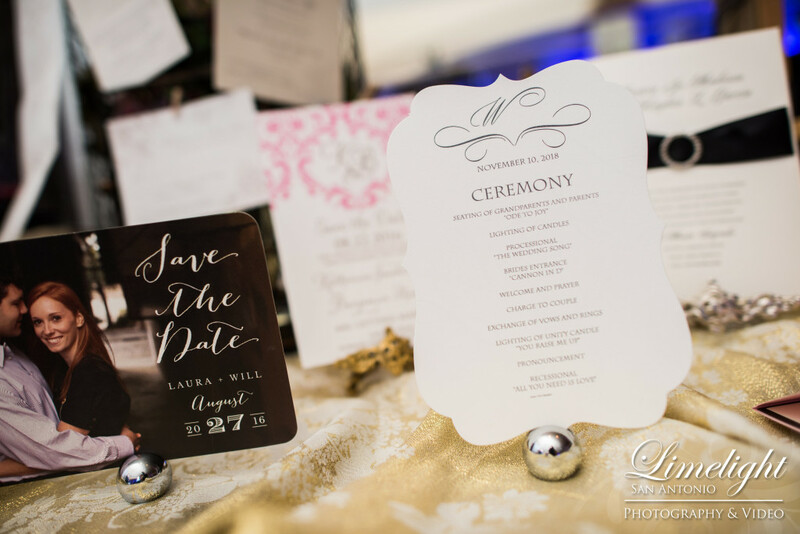 I’m going to walk you through tips on how to stay calm during the wedding planning process. Make lists of what you need to do and keep organized by having a large binder where you can keep all your photos, contracts, notes, and receipts. Just be sure to not forget it when going to vendor appointments. I have seen this happen all too many times. As far as the lists…make them small, maybe a list of 4-5 items at a time so you do feel so overwhelmed. Also, feel free to delegate tasks to family members and friends. They would probably love to help you, just ask! The great thing about the internet, magazines and PLANNERS is that they all can provide you with a detailed monthly to-do-list during the wedding planning process. It will keep you on track on where you should be at which month and in what order you should plan everything. If you would like this list please contact me and I would be more than happy to email you one! Attend bridal shows, open houses, ask friends that have already gotten married and read reviews on the internet to find great wedding vendors. Also, be sure to interview vendors before choosing one. 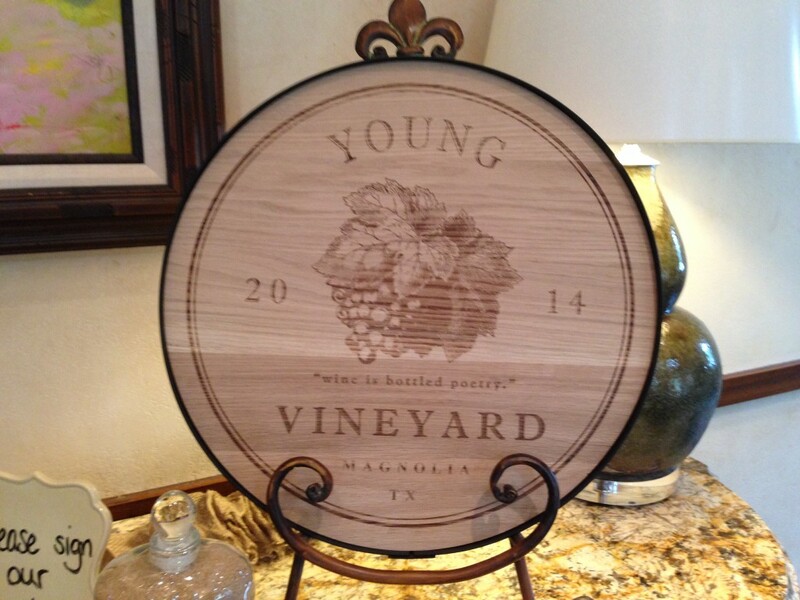 In some of my past blogs I included lots of questions to ask different type of vendors. Please go back and read some of those blogs to get those questions. 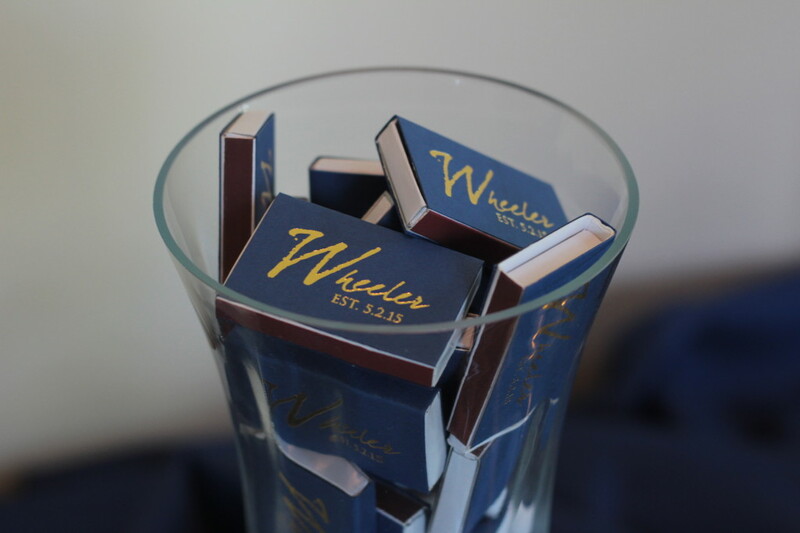 By choosing established vendors with good reputations you are in a win-win situation and you ensure a stress-free wedding day. If you are planning everything yourself you need to take some time off to get your mind off of it, occasionally. Please do this! 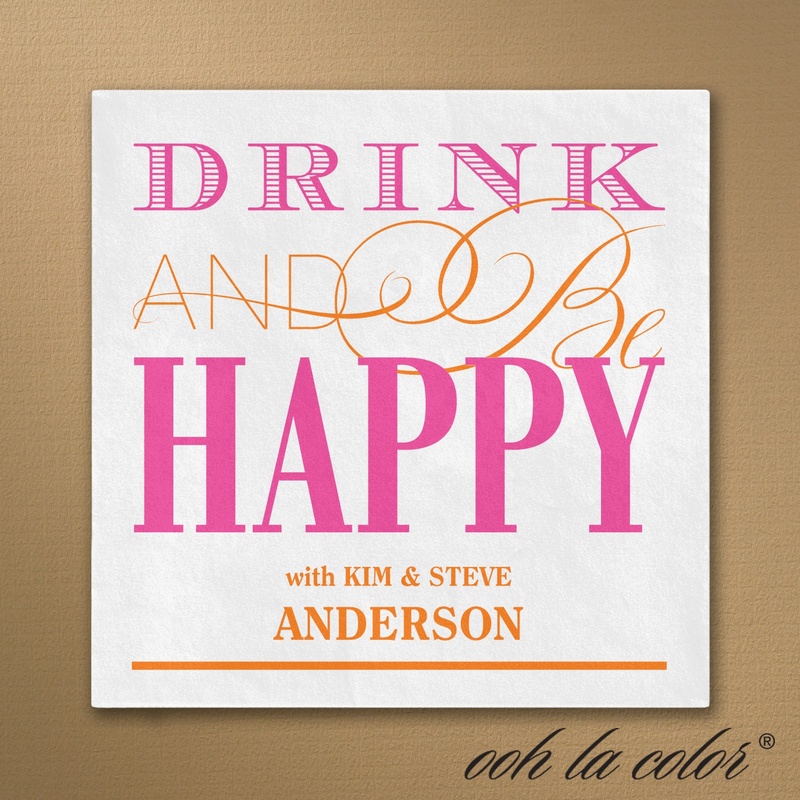 Just relax for a weekend enjoying other things with your fiancé or friends. You will feel refreshed after a relaxing weekend with them. 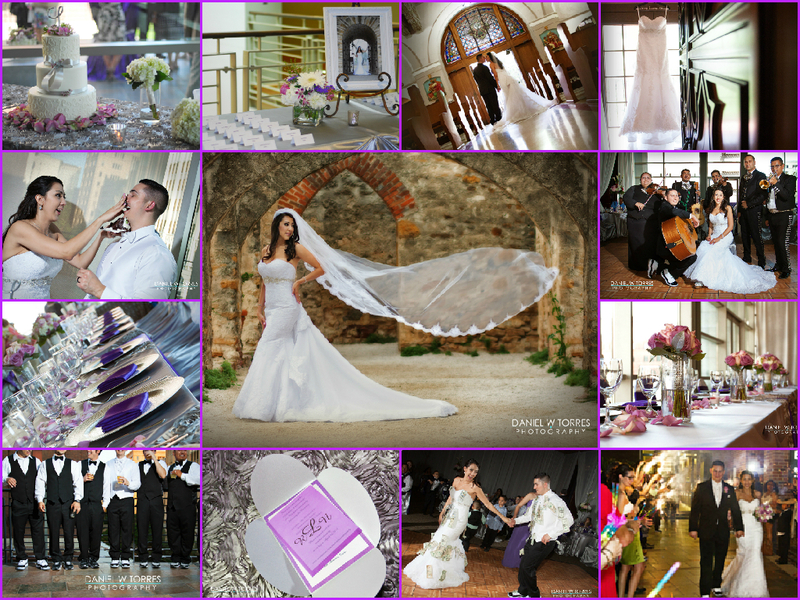 I have found that more often couples are planning their weddings more than 1 year in advance – you have plenty of time! There is no reason to rush through it all. 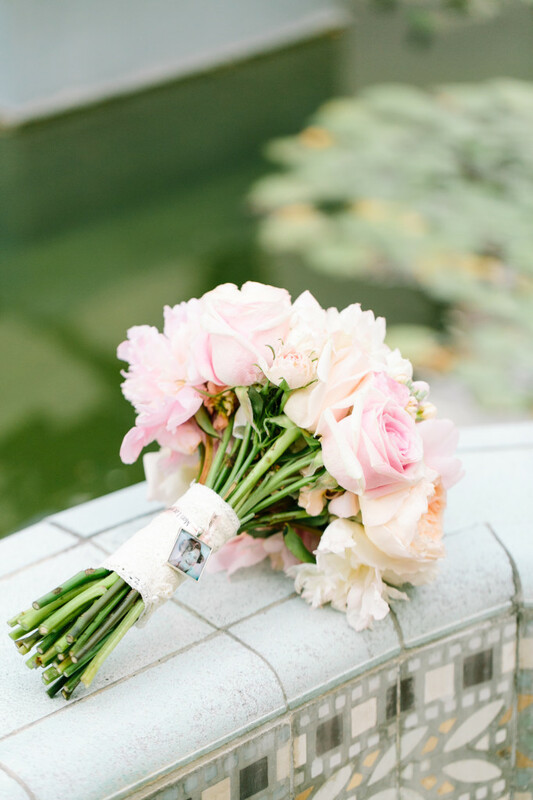 After you have locked in the venue, the most important piece to the wedding, then just relax for a bit and get refreshed before tackling the to-do-lists. If something doesn’t feel right or doesn’t quite go your way then step back from the situation and discuss it calmly with your fiancé or parents first and then with the vendors. A solution can happen. 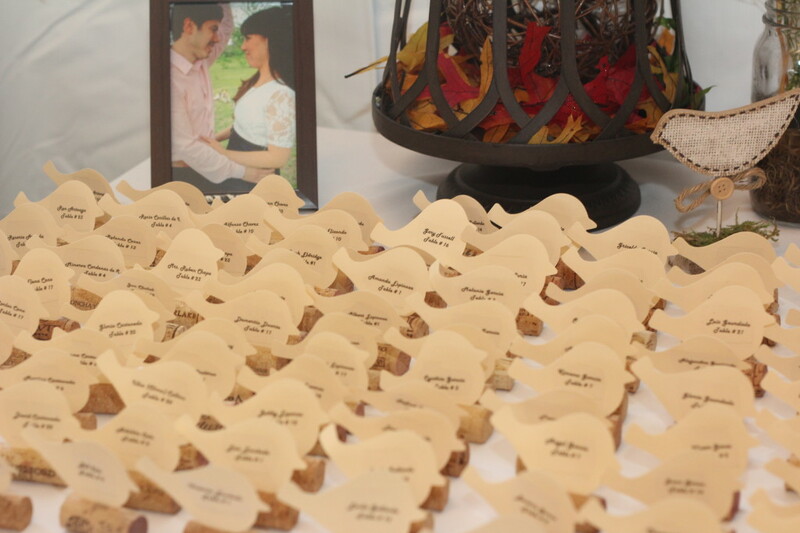 Most vendors will go over and beyond to ensure the couple is happy and will help to resolve the issue in any way. If they don’t, then maybe they aren’t the right fit for you. Hopefully, they will return your deposit and you can move on to another vendor that is a better fit. This is where I have seen brides across all spectrums…the laid back, easy going, happy about anything bride to the very detailed, organized, uptight bride that can’t relax on her wedding day. I feel so sorry for those 2nd type of brides. My job as a planner is to ensure a stress-free day for the bride but sometimes there is nothing I can say or do to change this. 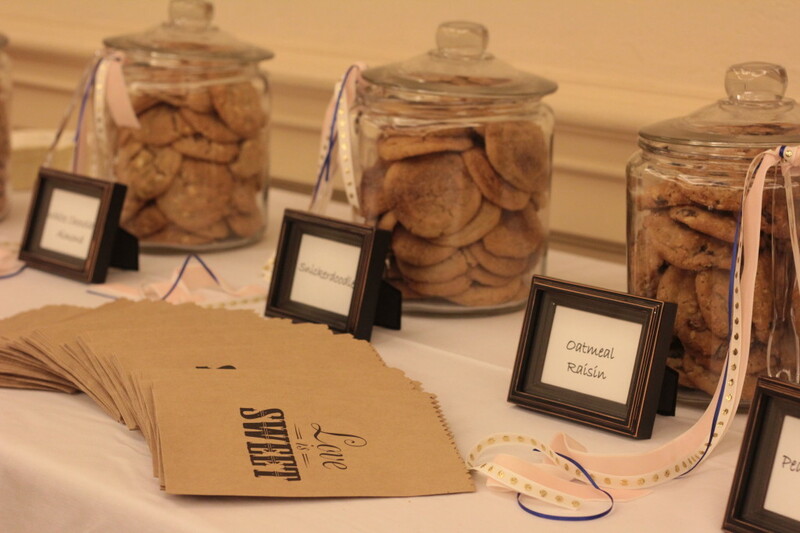 I work so hard behind the scenes to make sure everything is set up, vendors have arrived, the wedding party has what they need, and so much more. The bride has to trust me that I will take care of everything so she CAN relax. If something does go wrong (ex. starting late, someone in the wedding party doesn’t show, a vendor messes up in some way, etc.) please, please, please just try and brush it off and don’t worry about. Most of the time no one even knows what went wrong. 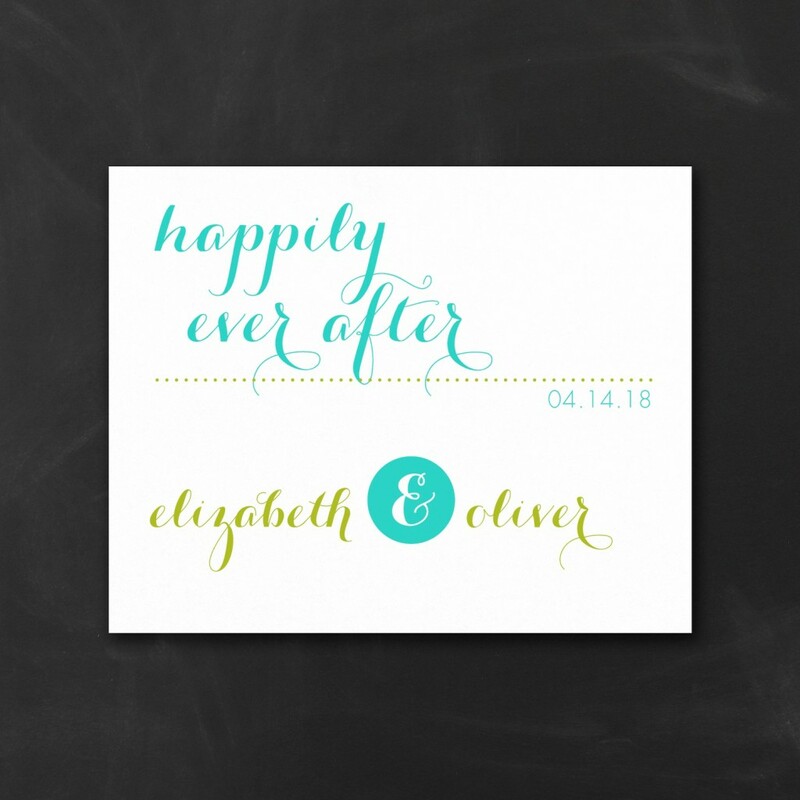 Think about all the great things that went right that day…you’re getting married! 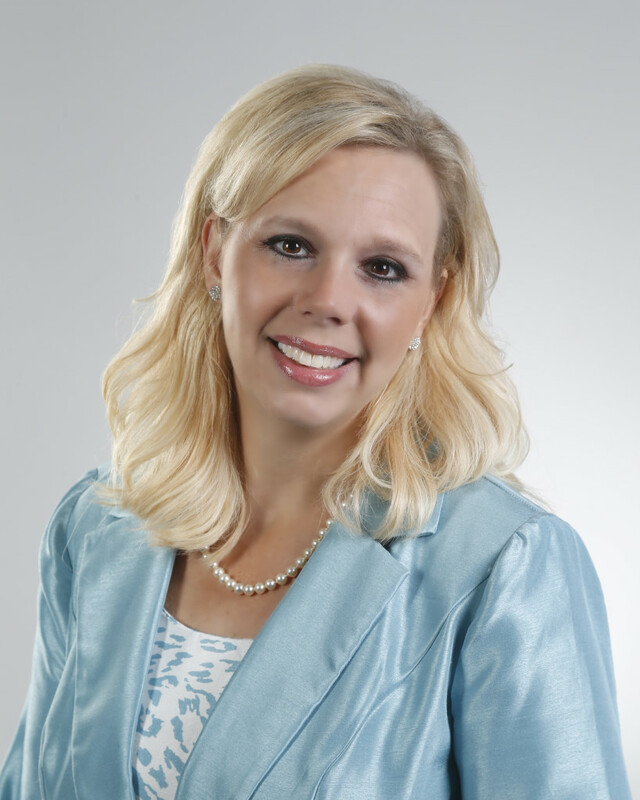 I have mentioned several times in this blog just how valuable a wedding coordinator can be to having a stress-free day. I hope you seriously think about the advantages to having one! Not only can we help for the day of but we can help throughout the entire process. 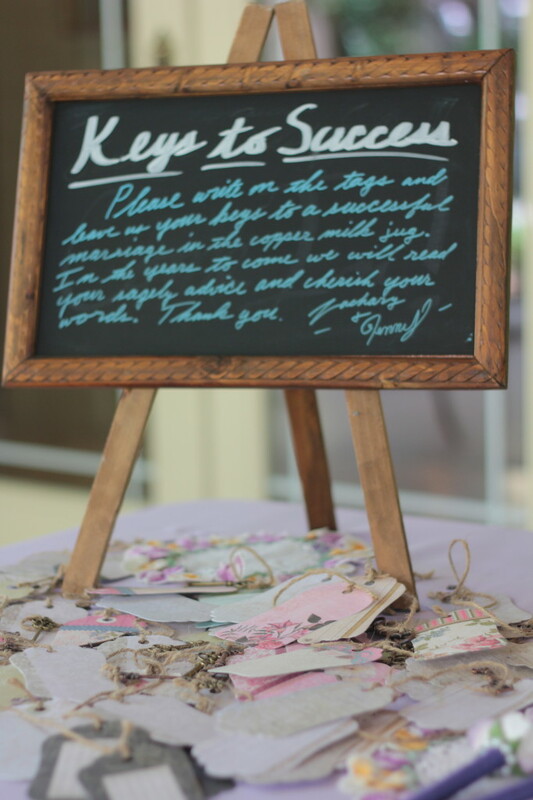 We can recommend vendors that are trust-worthy, help with décor ideas, tell you ways to save money, guide you in when/what you should be planning, help with hotel blocks, create timelines, ceremony lineup sheets, diagrams of the venue, assist at the rehearsal, and so much more! 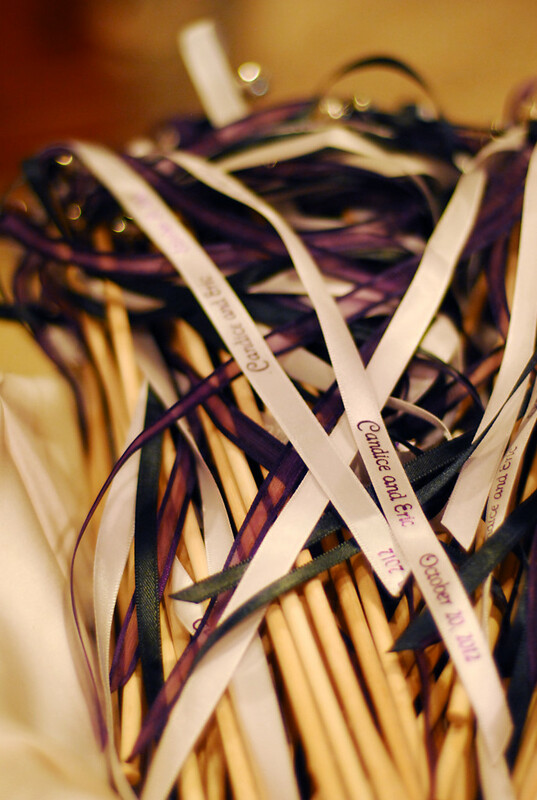 We can make your life and WEDDING…STRESS-FREE! 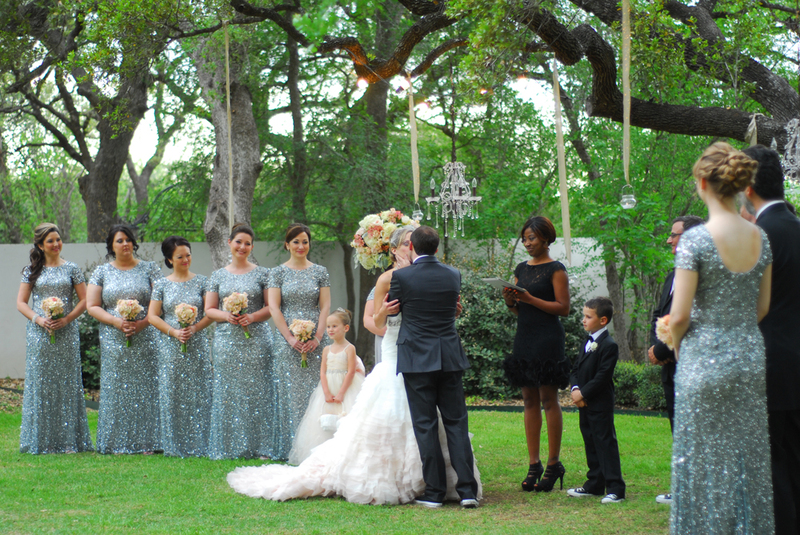 I must say, that I like many kinds of styles of weddings but I think I am most drawn to the glamorous, sophisticated style that is sparkly and glitzy. This means using simple colors like cream/white with silver or gold accents, in my opinion. It looks so celebrity-like, right? I recently coordinated a wedding (for day of) and the bride really had this style for her vision. I think it turned out pretty good, what do you think? 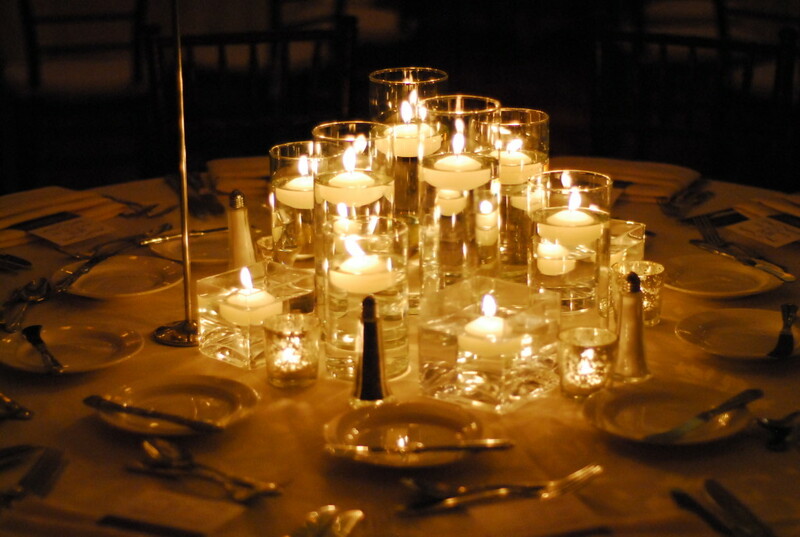 The first tip, is to make sure you are in a venue that really has the glamour already there. The St. Anthony Hotel in downtown San Antonio was built in 1909 and recently went through a renovation where they restored the hotel to the look and feel that it was of the 1920’s. 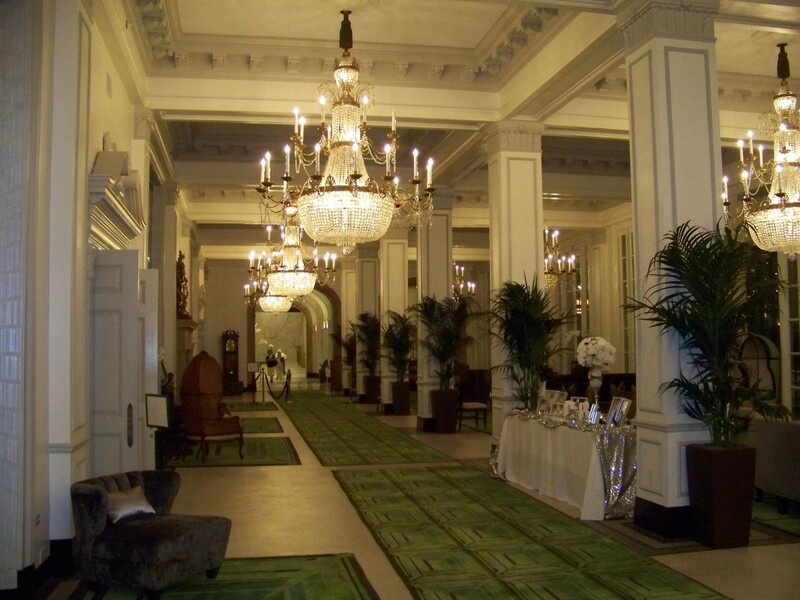 It is an exquisite hotel and every detail has been carefully thought of. 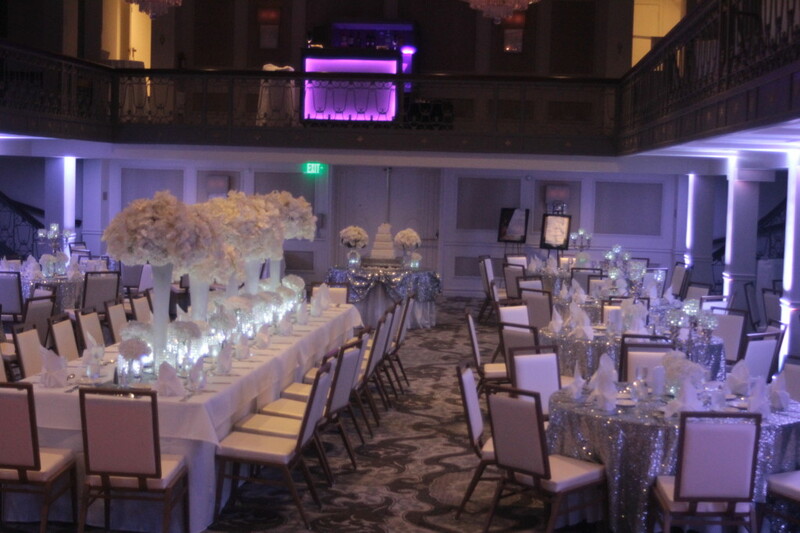 Since the ballroom was mostly white with grey tones it only made sense to have the colors also be white with silver accents for her wedding. 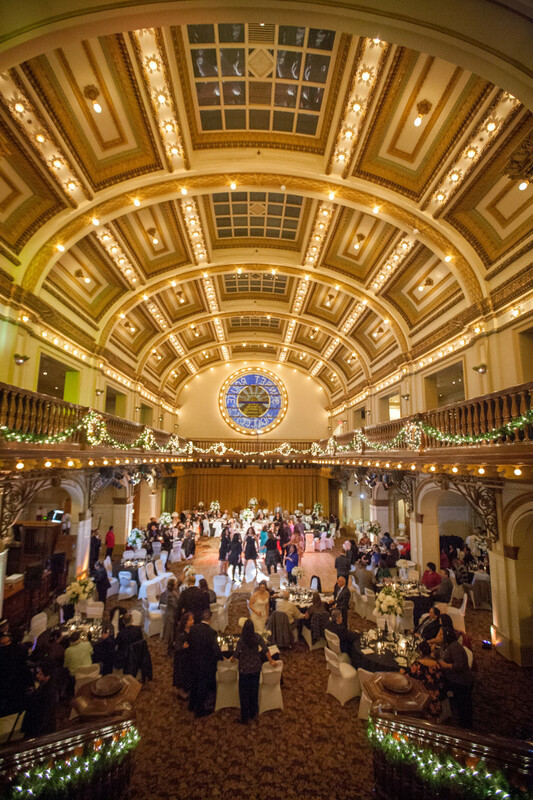 The historic Sunset Station is another great venue in downtown San Antonio with an exquisite look. It was the original train depot of San Antonio from 1902. The Depot, also known as, “The Building of 1,000 Lights” and “The Crown Jewel”, is adorned with ornate vaulted ceilings, stained glass windows and a grand staircase. Next, the flowers. You need to create a statement with height. Especially, if the room has high ceilings. 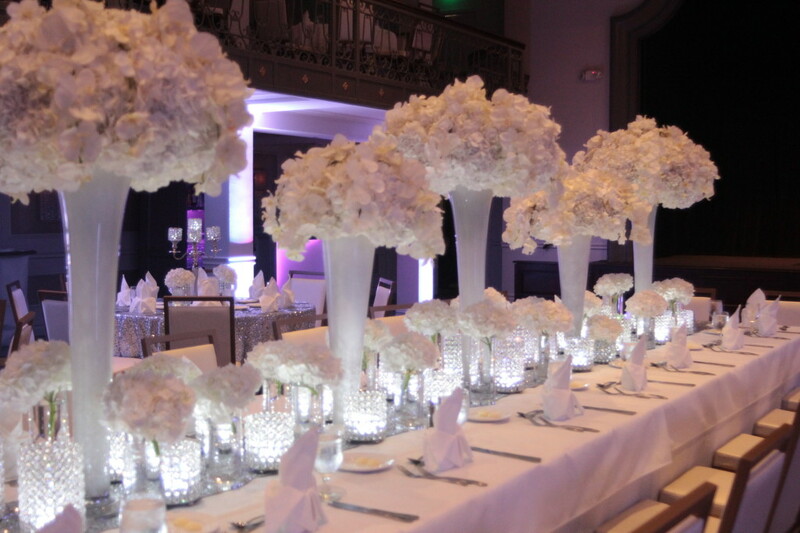 Look how gorgeous the head table looks with the tall vases and small lighted blinged vases too. Hydrangeas were the main flower which is great for price because it gives you a lot of fullness without having to spend a fortune on the flowers. Simple but elegant! 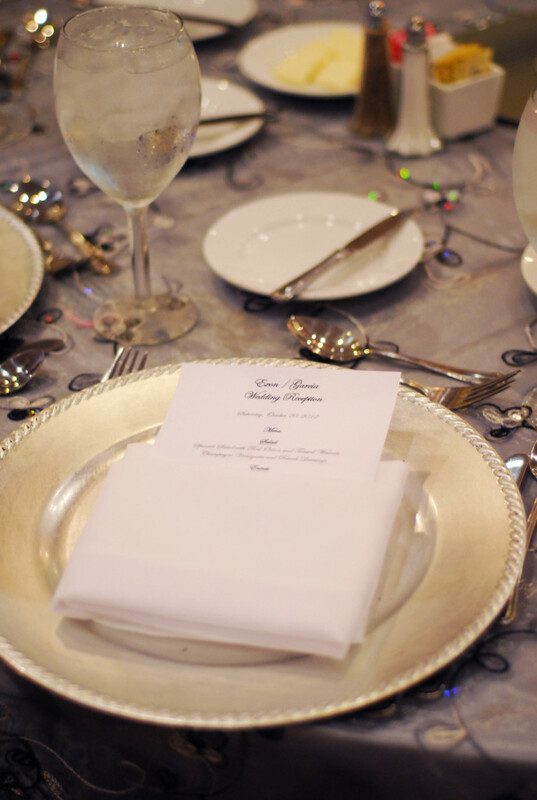 The sequined table clothes also gave the space a glamorous feel. 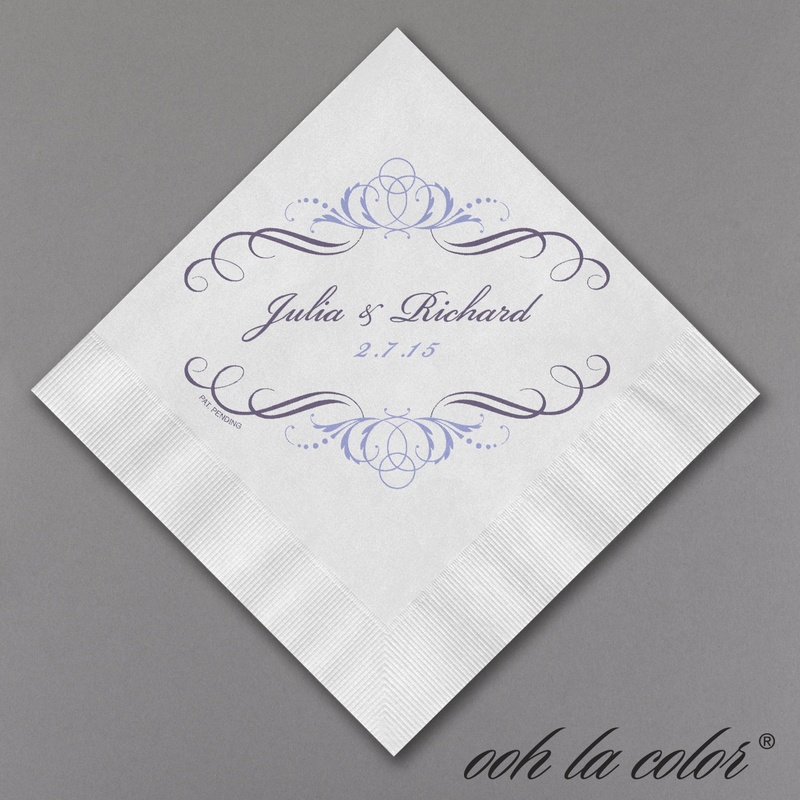 They are a little more than your poly or satin linens but look how great it looks! It is worth it if your décor is very important to you. 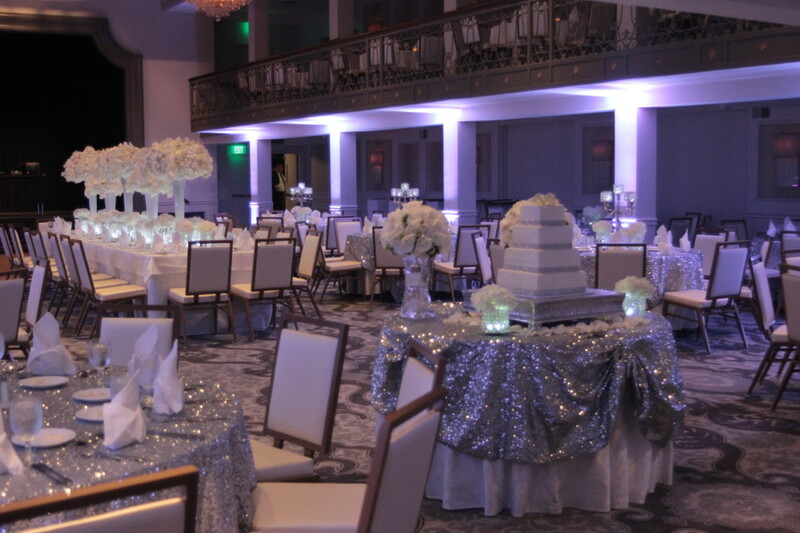 She saved money by only putting the sequined linens downstairs and leaving the hotel white linens on the upstair tables. Bisli did a magnificent job with the flowers and décor. 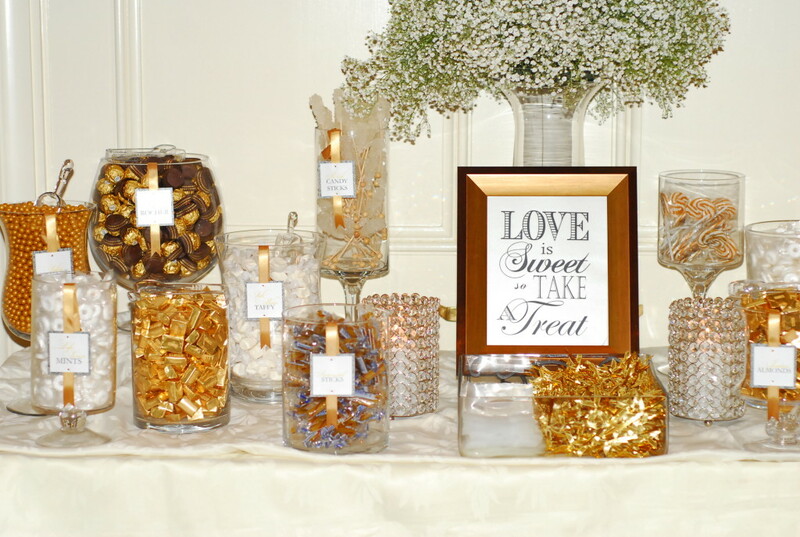 Your sign in table, picture table, place card table or candy bar can look glamorous too with sparkly picture frames, tall vases and beautiful linens as well. 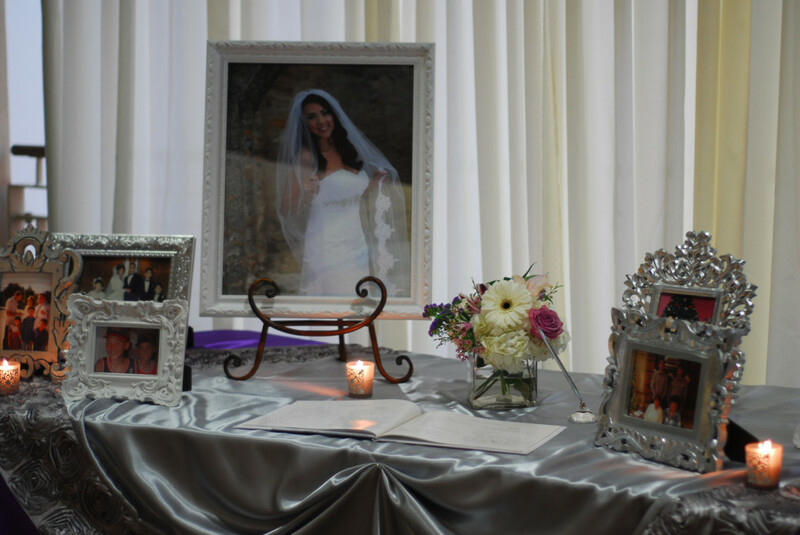 Here are examples of various tables from past weddings I coordinated. How about the gold look. Ok! 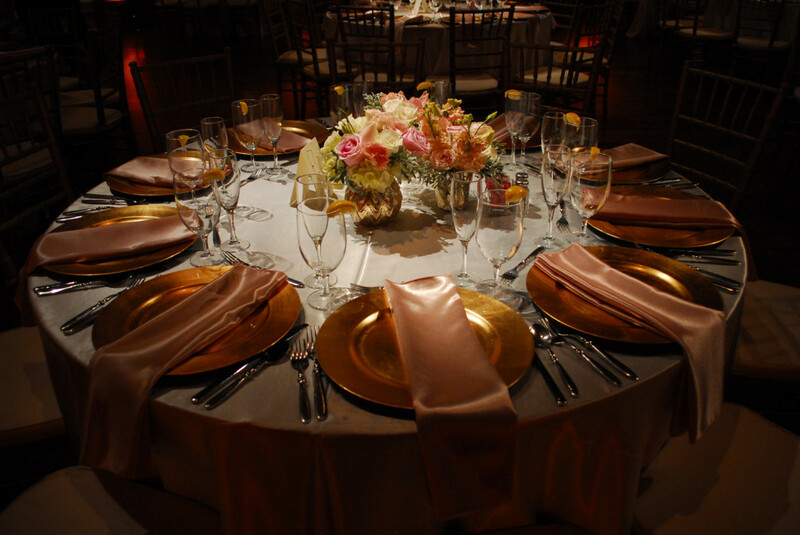 Here’s a wedding I coordinated where she used a lot of gold with champagne color for her linens. 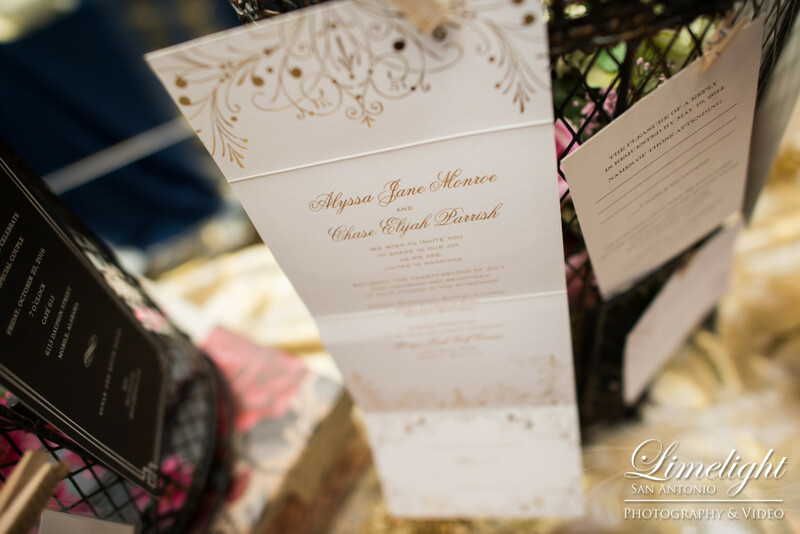 I think champagne is my favorite color for a sophisticated, elegant wedding. What do you think? She used gold vases to hold the bridal bouquets for her bridesmaids and guess what…they were plastic, super cheap! You can’t even tell. 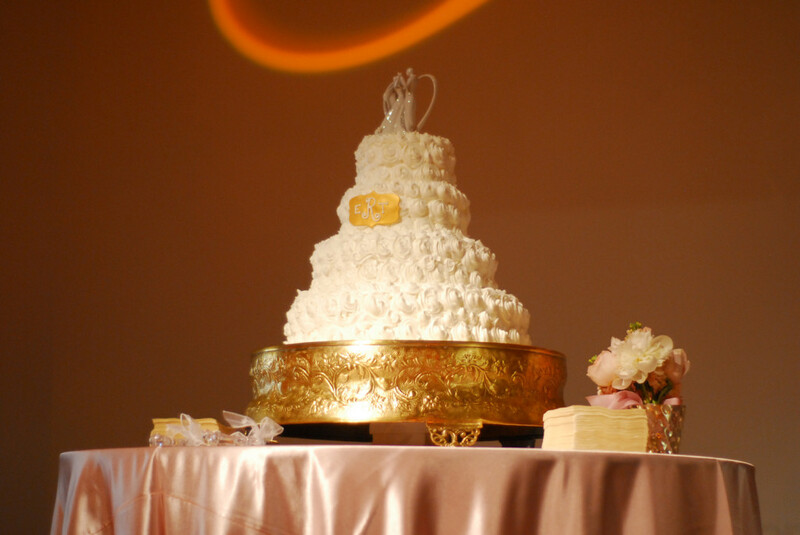 Other décor that can really add to the ambiance is the cake stand. 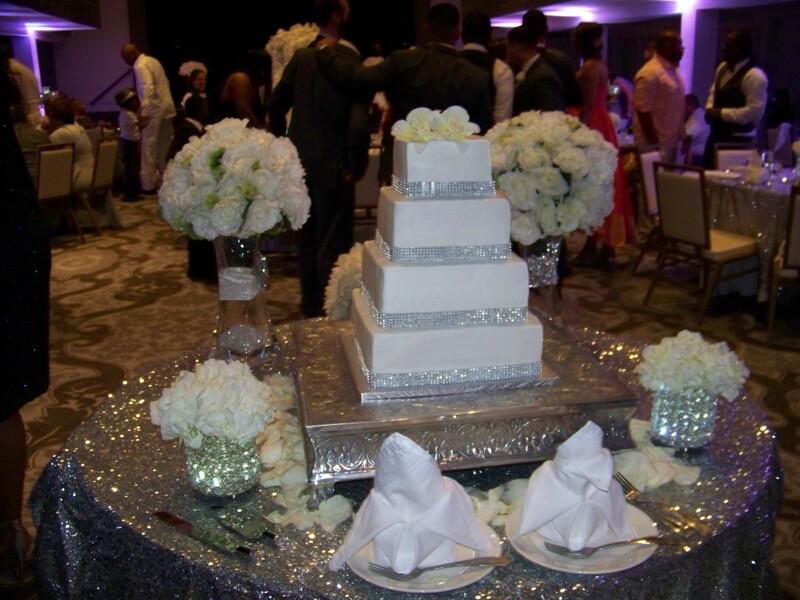 A large cake stand or blinged one can add to the look you are going for. 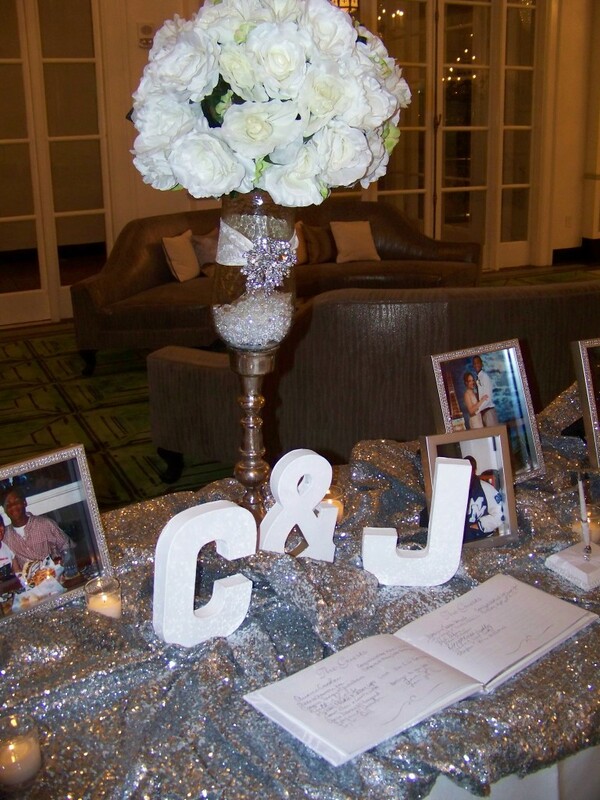 Think about using small blinged frames for the table numbers. 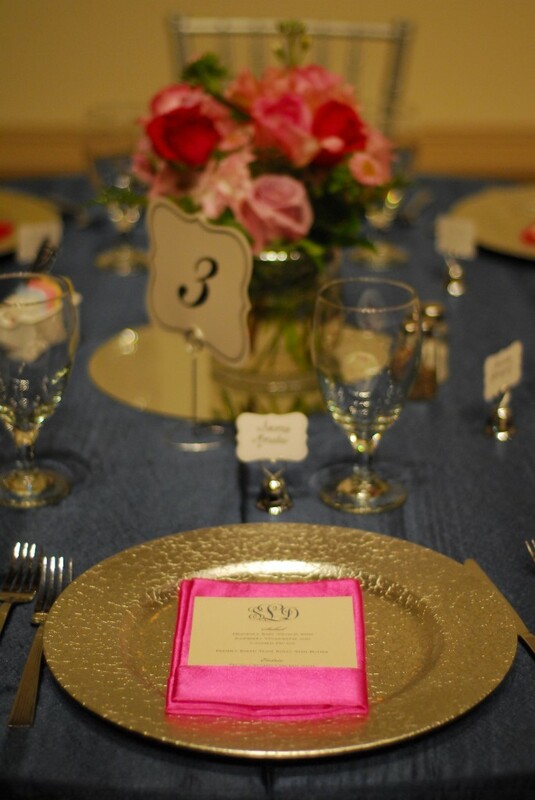 A fully set table also adds to the upscale look. Use china and glass, no plastic or paper!!! Use linen napkins and fold them a unique way or go simple with the waterfall which hangs down the side of the table, I love that one! 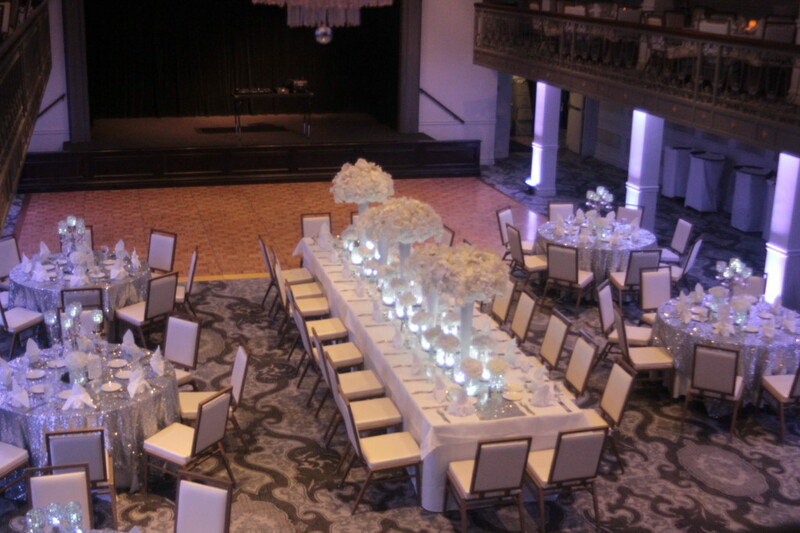 Consider other rentals such as uplighting, gobo, chandeliers, candlesticks, chargers and more to really add to the glamour! 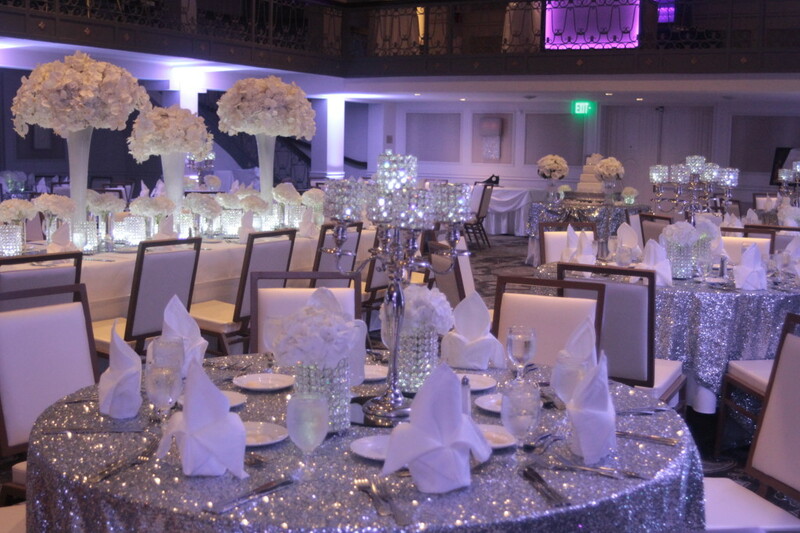 If you are the crafty bride, you can even buy bling in bulk and cut it and wrap around vases, make a cake stand glitzy, create napkin rings, etc. 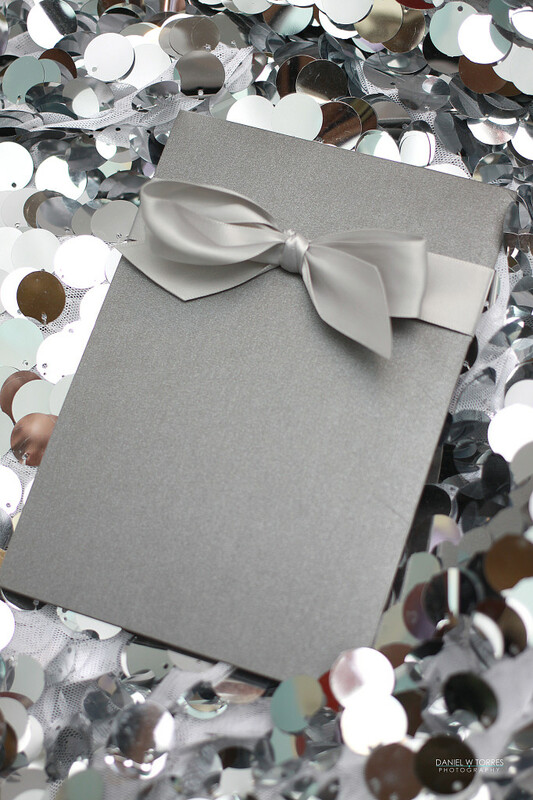 Don’t forget to glitz up your invitations and your bridesmaids dresses too!